Is it possible for a tint shop to produce a perfect window tint installation? Some people think so or even demand it. But, is such a thing even possible? This page will try to set the record straight on what you should and should not expect when it comes to your car's window tint installation. "You guys do PERFECT work!" We actually hear folks say that quite often. We take a lot of pains to put out a near perfect window tint installation but the truth is, we have imperfections in EVERY installation that leaves our shop. In fact, if you ask us to apply window tint to your windshield, there may be more than one small speck or imperfection due the difficulty involved and the large piece of film required to cover this window. WE DO NOT IMPLY, NOR DO WE GUARANTEE A PERFECT WINDOW TINT INSTALLATION. Even though we try hard, no one is perfect. The tedious nature of window tinting is such that there is absolutely NO WAY anyone can offer a perfect installation. If it were easy, everyone would do it and we would not have a business. Contrary to many YouTube videos, window tinting is extremely difficult. Even the most seasoned window tint installer can become frustrated with a difficult vehicle and have a total "breakdown". We know, its happened to us too. "So, if a 'perfection' is not possible, what should I expect?" Since there is no such thing as a perfect window tint install, you should lower your expectations a bit. Never will an aftermarket installation of window tinting ever look like a factory tinted glass that you may see on a truck, mini van, or SUV. Factory tinted glass is dyed during the manufacture of the glass itself. Therefore, the entire glass has dye mixed into the glass and is a complete product of its own. Aftermarket window tint is a completely different animal. When you take your car to a shop such as ours to have the glass tinted, we actually apply a film to the surface of the glass. Even though we thoroughly clean the surface, move very quick during the actual installation, and perform our work in a clean and climate controlled environment, we cannot control small particles of dust that may be present in the air. Some of these particles become trapped despite our best efforts to avoid them. You WILL have something in your tint if you look hard enough for it. The age of the vehicle can dictate the cleanliness of the installation. Obviously, a new vehicle with few miles on it is going to be much cleaner than a vehicle that has been on the road for years. Old vehicles are just plain dirty. That is not a reflection of the owner's ability to keep the vehicle clean. Older vehicles are just dirtier due to the fact that they have been on the road a longer time. 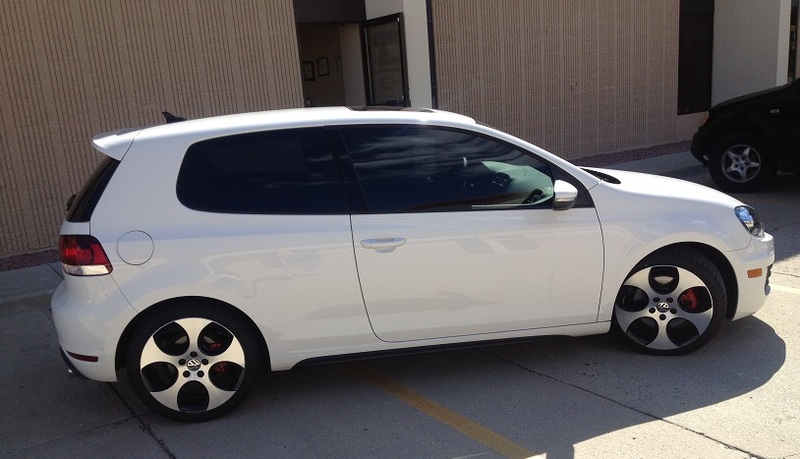 Even so, we are generally very successful in turning out a clean, near perfect window tint installation.